That’s actually the cover of last year’s national service issue of Time. I like it much better than the one on newstands this week. 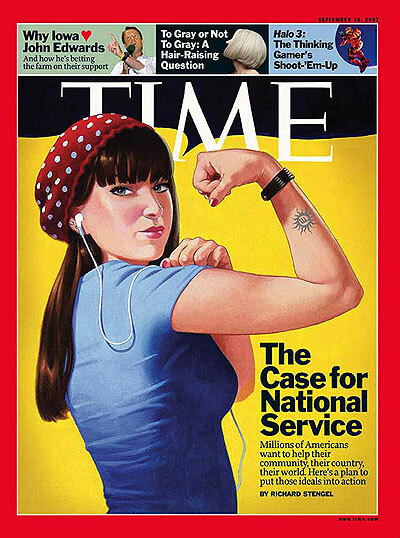 Time magazine is once again placing the country’s enthusiasm for national service and placing it front and center in the mainstream media. The cover story this week includes a list of Twenty-one ways to serve America. From my own perspective, I am not sure I learned much from reading Miley Cyrus’ opinions on service, but if the idea is to make service mainstream, I am for it. This entry was posted in Service News and tagged community service, national service, time magazine. Bookmark the permalink.